It really seems to be media week here at Electric Pixels. First, as previously mentioned, I appeared on the popular Tonight Live with Paisley Beebe show. According to their press material, each weekly episode of the videocast has up to 20,000 viewers, making it most likely the most popular show in SL these days. I was impressed by the truly professional organization involved in running this show; it’s not simply Paisley chatting with the guests, which itself is a very challenging task. There is a director to ensure all activities happen correctly and in the right sequence; a producer sets up the show in advance; camera and audio technicians record the event; assistants provide extra hands at any moment, and there is even security present. It’s little different from a RL TV show. We three guests were required to be present 90 minutes before the show to ensure we knew where to go, what to do, when to do it, in addition to setting all our video, audio and other preferences correctly. Nothing was left to chance, and that is the hallmark of a well-run operation. I had a ton of fun doing the show, which you can watch by visiting the SLCN.TV site, and I’ve seen blog reports here and here, and even a short Flickr stream here and another here. Thanks to Czq'bqymc for the great photo of my spontaneous combustion and impromptu studio rainstorm above. 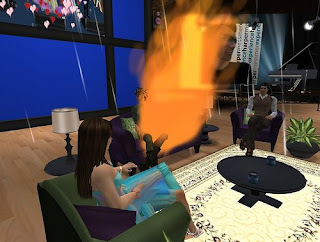 If you can manage it, try to attend a taping live on most Sundays at 6PM SLT in their Northpoint studio. As much of a splash as Tonight Live was, there was a second media event this week! I happened to be listening to the audio podcast Podmafia (episode 57 this week), when suddenly host Yxes Delacroix started describing my shop, Electric Pixels! She and Thraxis Epsilon had visited the other night and we had a long chat about many topics. I had no idea they were going to discuss my operation and say nice things. Thanks muchly, Podmafiaers! Podmafioso? Podmafia is perhaps the most popular SL-oriented podcast today, and is hosted by the trio of Yxes, Stuart Warf and Gomem Desoto. Even though they are very different personalities, they’ve got an amazing chemistry together that you can hear each week. Occasionally they record live in-world where you can not only observe the show, but also might even participate in yourself! What’s on for next week? Who knows, life is virtual and anything can happen. No, I am not chronologically challenged – I’m talking about an event that’s taking place tomorrow: I’m a guest on Paisley Beebe’s Tonight Live show, perhaps the most popular regularly-scheduled Second Live TV show! I’ve been doing some work with Paisley lately to produce remote control particle effects for her show and her concerts. She wanted to be able to produce fog, birds and other special effects and I built a very easy to use control panel for her. To me, the major design characteristic was to make it incredibly simple. Somehow I just can’t imagine singing in front of a large crowd while trying to figure out a complicated HUD or paging through menus. The singer should be focused on singing, not pressin’ buttons! After we completed the remote control project, Paisley wondered if I wanted to be a guest on her show, Tonight Live with Paisley Beebe! Of course, I accepted immediately. I’ve been to several live tapings of the show and they are always interesting and professionally produced. However, what viewers might not know is that the audience is usually quite lively, and often there are fun chats taking place unbeknownst to Paisley’s guests. The taping takes place at 6PM SLT Sunday the 27th, at the Northpoint studio, located here. And if you don’t make it to the taping, you can catch the show at http://slcn.tv/tonight-live-paisley-beebe later in the week. There’s always plenty of discussion about the nature of reality by those exposed to those brain-twisting twins: real and virtual life. Something about prolonged virtual exposure causes us to contemplate what it all means. Today I have that urge again, as I have had in the past. It’s a series of paradoxes. Poor are rich. Famous are unknown. Quiet are loud. Unloved are loved. It’s a separate reality. It’s the same identity. Or not. Some believe realities are so separate they can do things they should not do in RL. Others think their twin realities are the one and the same reality. I find the viewpoint of Atomics (those individuals who exist only in molecular form in meatspace) most enlightening. Many of them view virtual reality as a non-reality, something that is no different than a generic TV show or a bland magazine article. They cannot understand how the Virtuals are so “attached” to a “game”. But the same people who complain about “being on the computer too much” and “playing games” get upset when they detect overly amorous behavior taking place. They may be jealous, or even angry. How can they be so upset about something that was meaningless the previous moment? I think it’s because they are undergoing a transition before our very eyes. Oh yes, we virtuals have already been transformed. We understand exactly what’s going on. We have rationalized our conception of reality (separate or identical). It’s the Atomics who are changing. It’s like a concept I learned from Science Fiction God William Gibson on a recent podcast where virtual reality was contrasted with the emergence of the lowly telephone decades ago. Here’s how it works: when we Virtuals interact, we do so in an immersive, 3D audio and video environment. Our thoughts are transformed to actions through the rich medium and new personal experiences are created, stored in our memories forever. 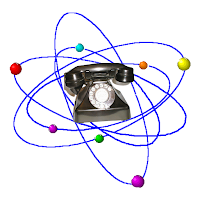 Meanwhile, after the Atomics complain about imaginary activity in a meaningless virtual world, they pick up their familiar telephone and dial. But what are they doing, exactly? They are using a rich audio medium to communicate remotely with invisible others, located untold distances far away. They cannot see their correspondent, nor touch them. In many cases they have never met them in the flesh. They may not even know their name – ever. And yet, this practice is considered acceptable and reasonable. But for them, virtual reality is Not Real. Another paradox. I believe the Atomics will eventually come to realize that virtual reality is a serious and rich medium of communication, and not “just a game.” After all, it’s just phone, isn’t it? Second Effects is pleased to announce it's now available in Mobile form. This means you'll be able to easily browse the site using your favorite handheld device, without need for a PC or Mac. To access the mobile version, simply go to http://m.secondeffects.com and the rest is pretty easy. You can see how the site may appear on a mobile browser by visiting the the URL from a regular browser. I've attached images of the site here to illustrate how it works (they are taken from an iPhone, which works very well with the mobile version.) A home page shows the titles and a thumbnail of the main image, if there is one. Once you access an article, it appears in a highly easy-to-read format, including all images and links. Why mobile? Simply because I've observed a rush of mobile capability recently: better mobile browsers, iPhones, Blackberries, etc. It may be that there are more mobile browsers in the world than there are PC-based browsers. I'd like to make sure that content from Second Effects can get to any of these devices as easily as possible. 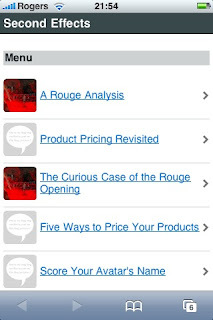 Newsfeeds are useful, but there is nothing like having a site specifically engineered for mobile use. Last week I analyzed the highly successful Rouge opening, and this week we’ll examine another opening. One that you have never heard of. While Codie’s Rouge sim opening’s purpose was to draw people in, have fun and make connections, this one has similar yet different objectives. But what is the sim, you ask? It’s the new island by RL insurance giant Aviva! We’ve seen this before, where RL companies pop up an expensive "billboard", usually having little idea of the culture, needs and attitude of residents. They last for a short while and then declare their experiment concluded (this is code for: FAIL). Many companies have come and gone, wondering how anyone can make any money in a virtual world. Usually the only party making any money is the virtual construction consultants who assisted the RL company. The Aviva experiment appears to be more of the same, but it is interesting to contrast their approach with Codie’s. You can read all about the Aviva opening right here. To spare you from the reading the article, I’ve extracted the most interesting aspects. Sure. And what exactly would I expect to see on a visit to the Aviva sim? That’s pretty nice. I’ll be looking to see the “messenger bags” on avatars during my travels, or perhaps even highlighted in the SL fashion blogs. Suppose there actually are avatars who wish to become a “Life and Annuity Agent”. Should they drop by the island and get some information from the inevitable kiosks and notecard givers? So the sim is actually closed to visitors! But wait, I *really* want to be a “Life and Annuity Agent”. What do I do? Really? We wouldn’t want to make this any harder, would we? I’m wondering how a potential “Life and Annuity Agent” would discover an interest in that career If They Can’t Even Get To The Island First! That’s three recruits every two days for the entire year. Sigh. Only a small percentage of visitors would likely become recruits. The invitation procedure and significant absence of in-world marketing suggests few visitors are likely and that this expedition may not work out exactly as envisioned. Pictures and videos of the Aviva site are also available for your viewing pleasure. 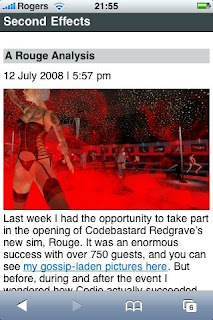 Last week I had the opportunity to take part in the opening of Codebastard Redgrave’s new sim, Rouge. It was an enormous success with over 750 guests, and you can see my gossip-laden pictures here. But before, during and after the event I wondered how Codie actually succeeded so well. An examination of what took place could be instructive for any business wishing to stage a successful event. One of the best, if not the best sim builder: Eshi Otawara. By engaging Eshi, Codie not only landed a top-notch builder, but also the reputation of the builder. Eshi’s work always attracts attention, regardless of what she’s building. For the weeks surrounding the opening, attention to Eshi also meant attention to Rouge. Party time and date sufficient to cover all planetary time zones. Most avatars now seem to originate from time zones other than North America, a fact often forgotten by many who host events. Codie carefully selected a broad weekend time slot that enabled everyone to have a fair chance of attending. Of course, it required her to be around for a massive number of hours, but that’s the price of success. Announcements. One of the most basic promotion techniques, announcements flew in every direction before the opening. Codie used her own blog, of course, but also through here extensive network of friends announcements or mentions appeared on many blogs. Generous invitations to her SL group. Invitations to the CodeRed group were offered, especially before the event and anyone who wished an invitation probably received one. Announcements went out to the group members on an increasing frequency as the date and time of the event came closer. If you were a member, there was no way you could have missed the information. Press Conference. The evening before the event, Codie held a press conference where invited media and bloggers had an exclusive preview of the sim and were able to ask questions of not only Codie but also the builder, Eshi. Incomparable DJs. The long duration required multiple DJ shifts. Codie arranged for many preeminent DJs to appear during the event. Quality Free Gifts. Gadgets detected guests and provided items randomly. If you weren’t lucky with the random gifts, there were several name-brand gifts for the taking directly. Leveraging social networks. Like many of us, Codie belongs to the vast social cloud of blogging, tweeting, flickring and most recently plurking. Codie has a habit of telling everyone what she’s up to, and the Rouge meme spread thickly through the SL social sphere. By the way, Codie happens to be one of the most active SL Plurkers (#2 as of this writing, with Gabby Panacek #1 and yours truly at #5). Blog Post-Event-Buzz. After the spectacular event, many blogs (including this one) posted reports, pictures and commentary. Codie rounded them up and posted an extensive list of pointers to all of them. Anticipation. The most important and final item was how the entire operation unfolded. It began weeks away when Codie announced on Plurk that she was obtaining a sim. We then saw every stage of development mentioned: The sim was transferred. The sim was named. A designer was hired. DJs. Ideas for the build. More ideas. Contributions. Building. Questions. More building. Scheduling. Invitations. Frantic activity. As a mere observer, I read the bulletins and gradually began to feel like I was somehow part of the action. I wanted to know what happens next, since the bulletins became a kind of story with an unknown ending. Finally, when the sim actually opened it was totally obvious that I should go. That’s how everyone felt, because we were with Codie every step of the way. Is there a better way to open a sim? Perhaps, but I couldn’t tell you. Maybe Codie can. Well done, my friend! Last week I posted the basics of product pricing, but there is a lot more to the story. Friend Dandellion Kimban posted her theory of pricing, which proposes a number of psychological and sociological factors are also at play. I believe this to be true, and in spite of the advice I provided last week, I often do guess at prices because of these very factors. While the pricing of particle effects is not as sophisticated as in the general fashion industry, I have personally observed two examples of Dandellion’s theory. Many months ago a large-scale landowner came by and recommended that I raise my prices. “They are too low”, he said. At the time I believed that lower prices were required to “beat the competition”, whoever they might have been at the time. But this guy appeared to be successful and therefore may have known something I did not. I like to experiment, so I raised my prices to nice round (and larger) numbers. Amazingly, business picked up immediately. Not lots, but definite and consistent from then onwards. The second occurrence was much more recent, and dealt with the issue of pricing custom built particle effects. I get many visitors coming by requesting all manner of custom builds. Sometimes it goes badly, but most of the time I am able to more than satisfy customers with cool stuff. I guess they like the products because people keep asking for more. Eventually, I simply did not have time to handle all the requests. I had to do something, as the situation was getting out of control. I could have just turned them away, but instead I did what most business owners do when demand outstrips supply: I raised my price. I set a minimum fee for any custom effect. And depending on the complexity of the item, the price could even be higher. Take that, numerous sequesters! My thoughts of having a more relaxing time quickly evaporated when I discovered that no requester balked at the minimum fee. Fine, I said to myself. I will do the work and get paid more for it. More clients began to arrive over succeeding days. So many that I suspected them of conspiring with each other. Yet they were not. I was making more money and getting even more demand, but why? Dandellion has the answer: the price sets the price. For a quality item, a higher price transforms it into an exclusive item, more desirable than it was before. My advice: set your prices very carefully indeed. I had the opportunity last night to attend perhaps the biggest non-Linden event this year: the opening of Rouge, a new sim owned by the highly delicious Codebastard Redgrave. Codie, as she is known, cranked up the sim's avatar limit to warp-speed: 90 avatars. And there were 88 at one point when I was there. The sim-opening party had everything going for it: an astounding build concept by Eshi Otawara never seen before; fun things to do; incredible DJs; complimentary gifts and "A-List" SLebrities from wall to wall. It was as perfect an event as could be arranged. How did Codie do it? I've been thinking about the truly skilful manner in which this operation was conducted and will write my analysis next week. But for now, let's take a look at the pictures! Blogger, builder and squid-lover Jacek Antonelli sans wings. Jacek recently made the final short list of candidates for Dusan Writer's interface redesign contest. And she is seen here wearing a lot more clothes than many other guests. Fashionista Celebrity Trollop spent some time at the opening party, especially some, erm, quality time with owner Codie herself. Another famous fashionista, TheDiva Rockin also danced at the party, but modesty prevents me from publishing any pictures of her! Zoe Connolly keeps appearing in this blog. Why? One reason is that the virtual aviatrix simply is everywhere! She appears at practically every SL event and on every web2.0 service you could name, too. A second reason is, well, just look at the picture! Blogger CeNedra Rivera and I had a chat during the opening. She's recently posted the results of her very interesting experiment in which she visited locations while wearing different shapes, skins and clothes. As you can imagine, it didn't go too well for the newbie look. SpiderKitten Mirabeau's colors complemented the Rouge lounge very well. "SK" is one of those people that I first met on Plurk, the new uber-Twitter. It's bad enough when you haven't met the people behind the avatar, but this time I hadn't even met the avatar! Nice to see you in the pixels for the first time, SK! Codie's dance floor included many wonderful particle effects, which of course caught my attention. Fog, stars and some green stuff were flying in all directions providing a certain flavor to those nearby. I'm pictured here beside self-proclaimed podjacker Crap Mariner with Tenebrous Pau on the right. Complusive tweeter Malburns Writer is floating in the air instead of Crap for some reason. I'm glad Codie doesn't open a sim every weekend, since I just couldn't keep up. Congratulations, Codie! Lately I’ve been fussing about product prices. As many readers know, I run a particle effects shop in the Second Life Virtual World™ called Electric Pixels. The shop now has around 200 items for sale and many thousands of items have been sold over the past year. But how do you go about setting a price for an item? Or worse, how do you go about setting a price for a custom, one-time-only product? Give it away! Yes, this is indeed a strategy. Contemporary web services use this technique often, and survive by selling advertising or providing add-on services for a fee. I suspect this approach may only work for certain kinds of virtual items. Or it can be used if you wish to promote your business or contribute to the community. Price based on Effort: How long did it take you to make the item? One hour? Two? What is an hour of your time worth? This approach might make sense to the maker, but often doesn’t make sense to the buyer. Worse, in the virtual world hourly rates are typically not comparable to real-world rates. Some makers use this technique but their products are usually very unique, and that permits them to demand high payment. Price based on Value: What will the customer get from using the item? Will it speed up their process? Will they be able to sell more items of their own? How much money will they get by investing in your product? Determine or estimate their value and set your price to be lower than that so that it makes sense for them to purchase. If you set your price higher, they won’t buy it because it won’t make business sense. This is why pricing on sffort sometimes doesn’t work. Price based on Competition: What are competing products selling for? Is your item better or worse than the competition? Should you price yours higher or lower? Again, this test sometimes causes pricing by effort or value to fail. Even if your product is a good value, a competitor could still charge less than you. Price based on Volume: How many of these items are to be sold? One? Ten thousand? Your effort in making the item could be the same regardless of how many are sold. A single unit sale would have to recover all your profit on that one sale, while profit for a high-volume product can be recovered over a large number of sales. Typically unique one-time products are priced much higher than high-volume products because of this phenomenon. Which approach is best? All of them! Any product should be considered in all of these dimensions, and if it passes all these strategies, then you probably have a good price.